On Saturday we did a long ride from Reidsville to Statesboro, partly intending to scope out the home of Georgia Southern University. We set off from the campground a bit later than we hoped so it was warming up rapidly. 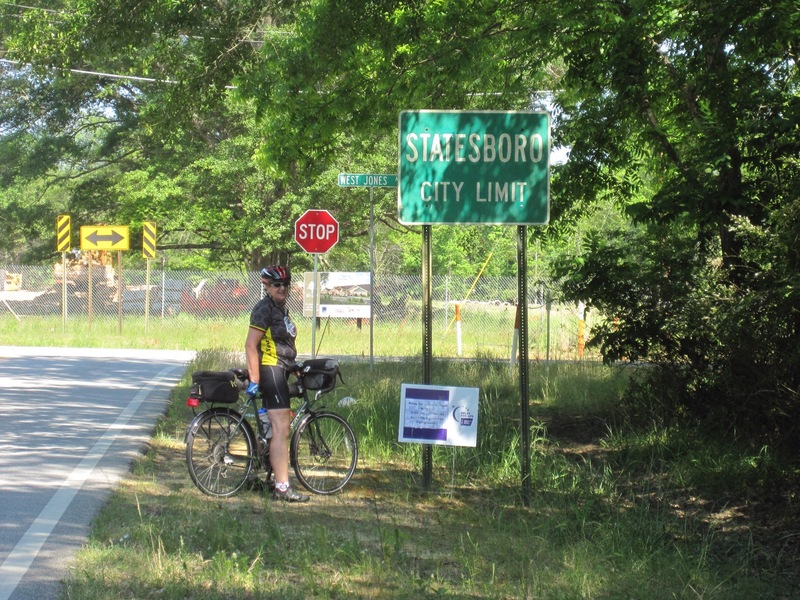 We had a brief conversation with some women doing some sort of fundraising thing, holding out buckets, at the traffic signal right at the start of our ride to verify our route out of town (the back way to Statesboro avoiding super-busy roads). We made our first turn and before we’d gone very far, a white pick-up went by with the driver honking his horn. Now, in many cases this would not be a good thing, but Angie actually noticed that the truck had a “Share The Road” license plate. I never imagined Georgia would have share the road plates, but there you are. The driver pulled over a little way up the road and got out. It turned out he was a fellow cyclist who just wanted to stop and show his support. He confirmed that we were on the right route for following the Adventure Cycling Association route map and chatted a while before going on his way. We plodded on, and I’m sorry we didn’t stop for many pictures because this was by far the prettiest day we’ve had on the bikes on this trip. What wonderful countryside in southeast Georgia! It was also hot, and the ride was definitely a bit hillier than any we did in Florida. I don’t have the full stat because my phone died after about 28 miles, but there was at least 400 feet of climbing. I know, woo hoo, but a departure for us lately. After a while, we really wanted to find somewhere we could sit to eat our lunch and take a break. As Henry often says, a good rest stop always has a place to sit. If there is shade and a bathroom, even better. After a long stretch of nothing, we came upon a woman and two girls, who appeared to be in the process of setting up a lemonade stand outside their house. It turned out they were actually selling cold water and grape drink. Henry offered to buy three bottles of water and paid for four. 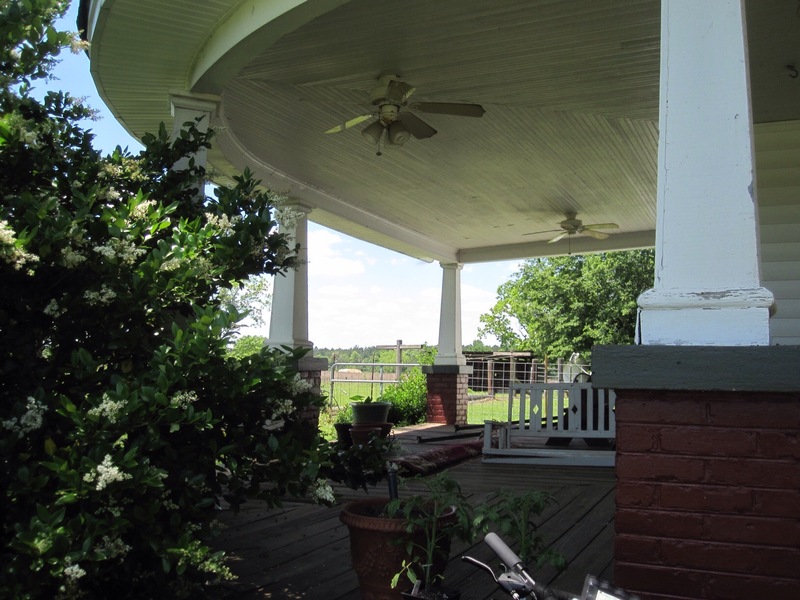 He was then very forward and asked the woman if we could eat our lunch on her spectacular wrap-around porch. She didn’t even hesitate before saying yes. How cool was this? The visit turned out to be one of those experiences that you think back on as a very special moment. The woman, whose name is Jeanna, made room on her porch for us and we sat in the welcome shade and visited with her and relaxed. She told us that the house had been built by her partner’s grandfather in 1918. Her partner, Yvette, came back while we were there, and told us the house had actually been built by her great grandfather. They are in the process of renovating the house and I thought it was really great that it is still in the family after almost a century. We couldn’t believe our good fortune stumbling onto such a great place and such wonderful hosts. After we’d eaten, Jeanna even asked if we’d like to use the bathroom (this rest stop was getting better and better) gave me a tour of the house, including the work they were doing to create some living space in what had been the attic of this single story home. We departed with hugs and deep gratitude for such an amazing experience. 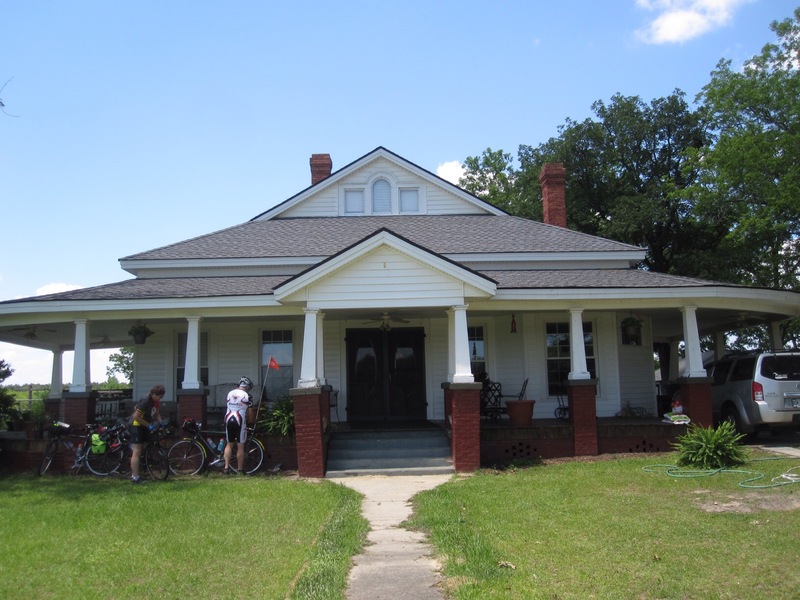 We carried on with our ride and managed to make our way to the Statesboro city limit. Pat was was actually waiting in the van just around the corner, so we took that as a sign that it was ok for our day to be done. I had actually bonked a bit and been forced to stop and eat something just a few miles before we stopped, so I was ok with a ride that was just a touch under 39 miles. 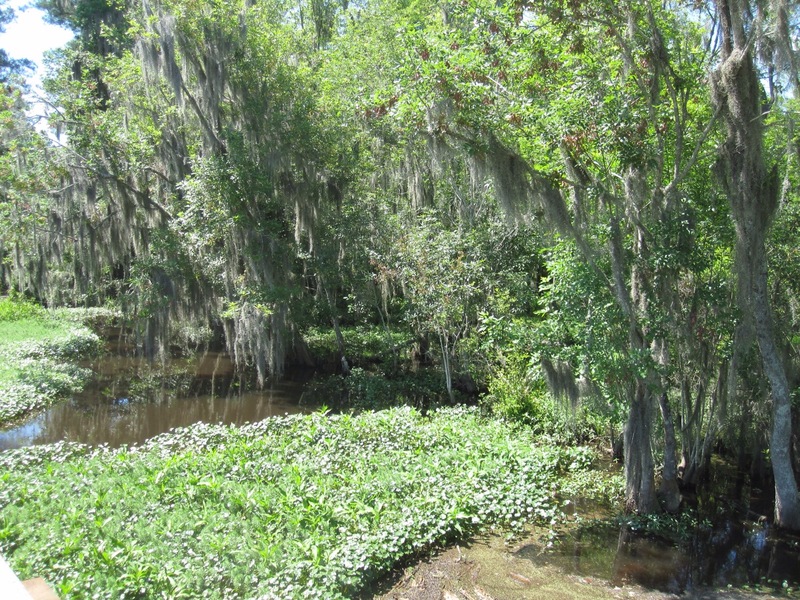 We loaded up the van and continued on into Statesboro to have a look around. We actually wanted to look for a market where we could buy some sausages and we hadn’t been in town for five minutes when we passed a meat market! So we ran in there and picked up some sausages: pork for Henry and chicken for the rest of us. What a great find. Back at the campground, which had filled up quite a bit for the weekend, Pat built a fire and we cooked the sausages over an open flame while cooking up some spaghetti and some tomato sauce. 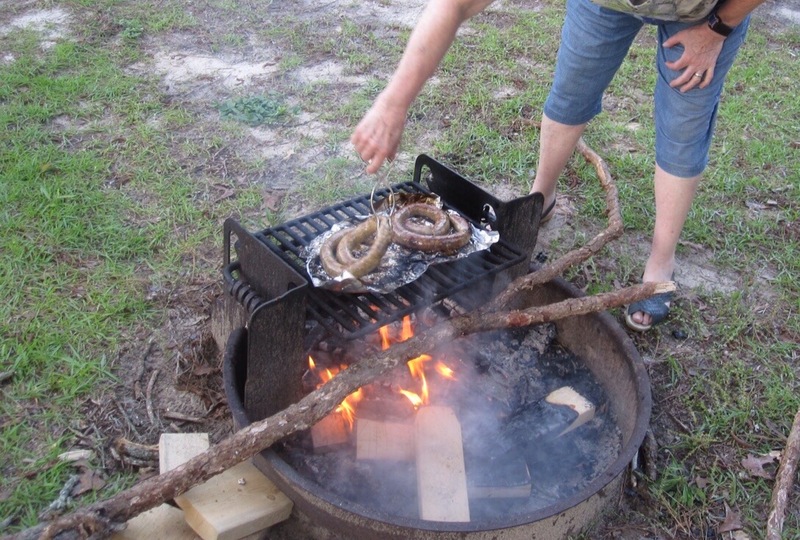 It was another delicious dinner after a good day of riding and some great experiences of Southern hospitality. That house looks amazing! Sounds like the people are, too!